I snuck some time today to finish a project that I have been dabbling with and I was so excited that I had to post about it. I've made a little bouquet inspired by penny rugs. I've used scraps of wool that I had felted from sweaters and coats, and tiny glass vintage buttons to create circular flowers. I attached them to floral wire so they can be arranged at will. I covered the back of each flower with black felt (also from garments) to cover the stitching and polish it off. The circle is a shape that is pleasing to my eye and I'm digging the color combos on this piece, they're natural but kind of punchy too. I'm happy with how it turned out now that it's finally done. Stitching is a soothing activity for me, and this bouquet represents several weeks worth of relaxation time for me. I hope those peaceful, happy vibes stay with the bouquet, wherever it ends up. A sincere THANK YOU! to all who entered, tweeted, and blogged my little giveaway. It was fun to read your comments and I look forward to browsing the many new blogs I've found this week through your posts. Now, without further ado, the winner as chosen by random.org is.... Meg. Congrats, Meg! 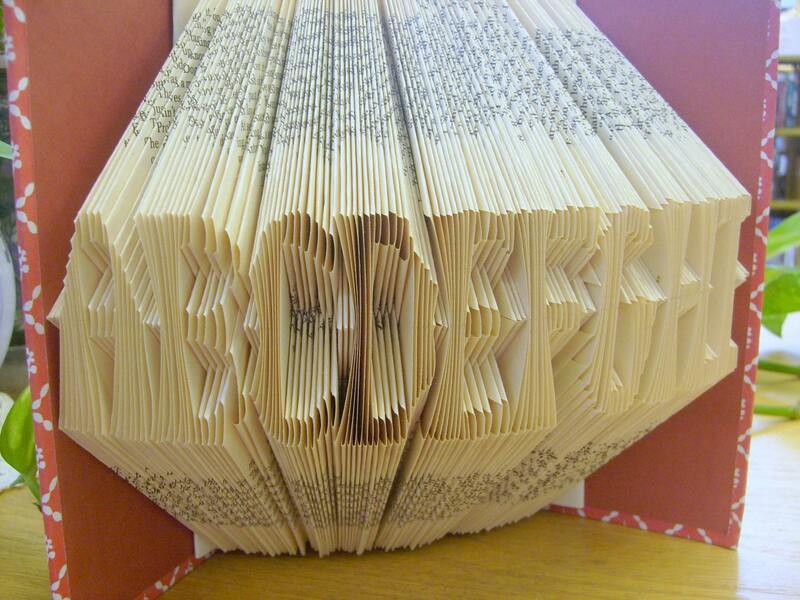 ABC Book Origami - love! They are in her Etsy shop, along with other wonderful folded pieces, including custom folded books and book jewelry. I have a project in my head that has been inspired by these two images and I can't wait to finish it. What's your inspiration today? I'm starting this week with a teeny tiny mushroom brooch, made of recycled felted wool. Measuring just a wee 1.5" wide by 2" tall, it's a bit smaller than some of my other brooches but I kind of like this little niblet of a pin. It just made its way into my Etsy shop. We've had company here for the past week in the Jordan house and oh what a week it's been. We laughed, played, ate, cracked bad jokes, played ball, and enjoyed our little family completely. Our guests left this morning and we're now adjusting to life as normal. I'm feeling a little off-balance after ditching craft for cooking this week. Instead of playing with wool or buttons I've been simmering and spicing, roasting and toasting. I'm sure I'll be reaching for the crafting soon but for now I'm in no hurry. I really needed this week's diversions and I don't want the taste to leave quite yet. During the week we took the kiddies to our small local zoo in Little Falls, MN which we all enjoyed. We also visited the Fishing Museum, stopped at our local growers market for some fresh-picked strawberries, went to the park, and went fishing. My husband took all of us to do a little shore fishing in an off-the-beaten-trail location and I was too distracted by the dismantled steel bridge and local flora to fish. I was found belly down in the grass taking pictures while the kids were catching sunfish. Normal. This weekend I think we'll relax a bit and then launch back into life on Monday. Look for another post early next week regarding a wee giveaway. ...and sometimes you WIN! I have been on the prowl again for some specific vintage buttons for a project that's in my head and whilst searching through a recent button purchase found these amazing buttons. Now, you should know that I am a fan of natural materials and I have a deep fondness for agates, so when I pulled these sweeties from the pile I let out a happy little squeal. Aren't they beautiful? I wish I had a jeweler's sensibility because I'm sure they could be worked into something fabulous. I'm not sure what to do with them, any ideas? Nature prints are such a fun, easy, nearly free project that will bring a beautiful bit of botanical goodness to your home. Give it a try and see what you think. It's really quite simple, but a few tips for success: choose a leaf that lays flat and behaves. Leaves that are all willy-nilly won't make for good prints. Don't put too much paint on your leaf or you'll end up with a gloppy mess. 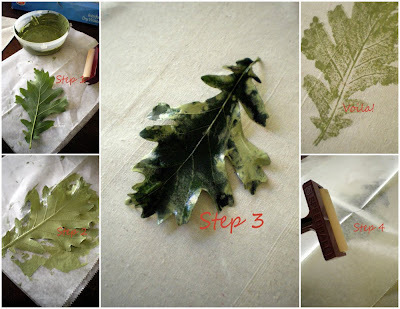 Don't press too hard with your brayer, you want to make a print, not embed the leaf into the canvas. Try it out on a piece of scrap first and once you get the hang of it, print away! I had several odd frames that I painted black and I printed on a piece of canvas drop-cloth that I had in the studio. (You can purchase them relatively inexpensively at your local hardware store) Printing on paper will give you a more crisp image, but I was going for something loose and organic. Experiment! The leaves, ferns, and weeds all came from the backyard. I think it would also be fun to take a print from a slice of wood, or long vines....maybe I'll try that next. This is a great project for the kids too. Get them involved and see what happens. Maybe make some pillows, print on t-shirts, make one of a kind cards...so many possibilities! Have fun! It's the 4th of July, Independence Day here, a day full of fireworks, food, and frolicking. Crafting for the next few days will be halted as we celebrate the weekend's festivities and prepare for the arrival of family next weekend. I've been working on new project that I hope to share soon but it's just not at the photo-ready stage yet. Until then I'll share some little cuties I've been working on using some of my felted stones, wool, and acorn caps. Expect to see more of these soon, and perhaps (nudge nudge) a giveaway in the next few weeks.